Started a big clean up the other day – it’s not spring here, but it felt like the time was right. 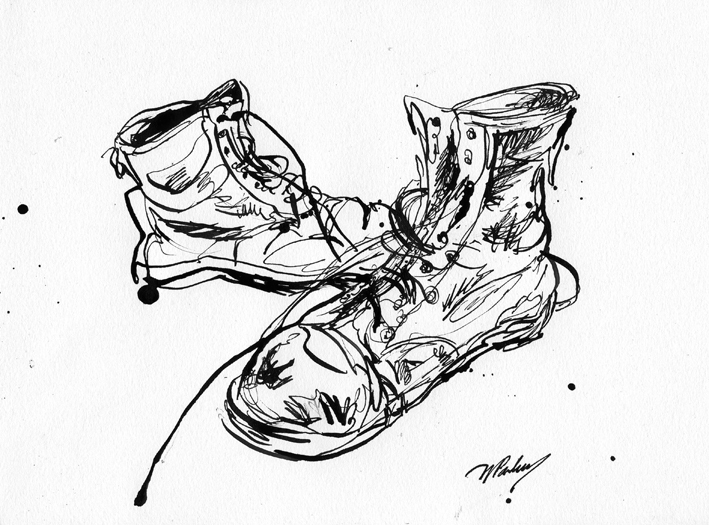 Anyway, I had to do the hardest thing and say goodbye to my first pair of Doc Martens. I stopped wearing them years ago – the soles were completely shot – holes deeper than the smallest crevasses in Antarctica, absolutely no tread left, inners worn away and because they have been lurking in the back of my cupboard for so long, a mildew pattern covered the surface. I only kept them for sentimental reasons, but I need the closet space. So I thought what better way to keep them with me forever, is by honouring them in ink. I bought them in 1990, I asked my friend Matt to come along and help me pick out a pair. It was probably from a store long since gone. I had bought a few others since then, particularly on a trip to the UK years later – but they were never as comfortable as this pair. I wore them every “wear” – backpacking around Greece and France, parties, funerals, might have snuck them into a wedding. Countless, countless concerts. At one point I even strung a silver ankh onto one of the shoelaces and it bounced around my heel (I did the wraparound shoelace technique) – It must have been in the days of reading Neil Gaiman’s Death (I looved Chris Bachalo‘s work). So adieu! Thanks for the memories in my most formative years. You stayed strong and were always there for me. However, you did let in a lot of water in your declining years. But all is forgiven, and now, even in your last moments of life you have provided me with inspiration to draw. Goodbye old friend, nice knowing you. Beautiful drawings and love your story! Great way to honour a pair of Docs. thanks Sasa – your work is amazing too. love your watercolours. 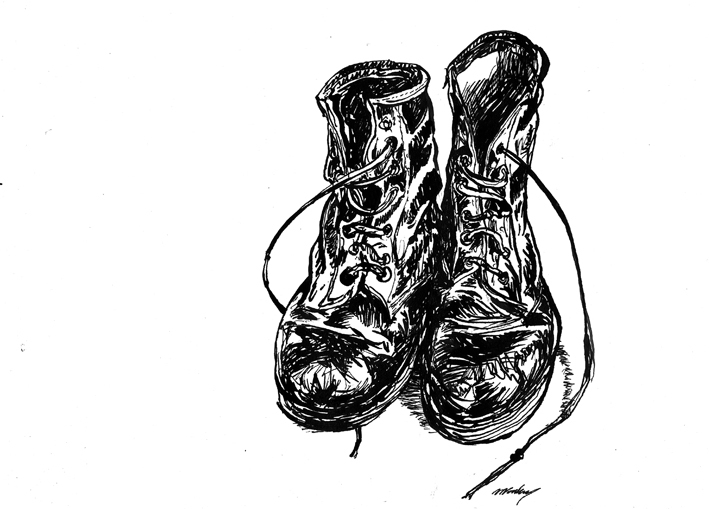 What a great idea for a drawing and it is fun to read about your history with these boots! Docs are great! thanks colleen. i like your experiments with watercolours, and your zombies and penguin – very cool. Nothing wrong with timberlands, Alex! great way to immortalize them! I should satrt cleaning out way more stuff! I’m in awe! Your sketches are excellent, so competent & assured. Love these!! 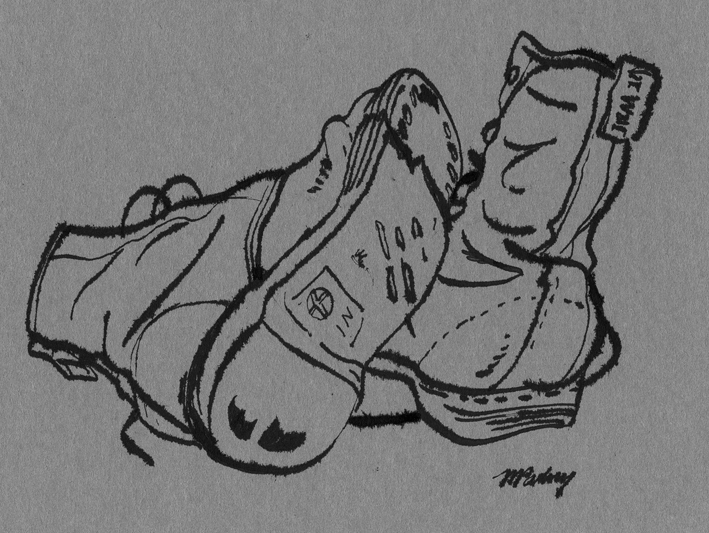 I really want to draw an old pair of work boots to add to my shoe drawing collection. Yours are really well done!! Great job!